As I looked down on the Great Slake Lake Shear zone from my flight back to civilisation, it was hard not to marvel at the sheer scale of it all. Below me stretched what used to be a plate boundary between two Archean cratons, the Slave and the Rae, and it is truly massive. Stretching for 25 km across and traced for 200 km in strike (Hanmer 1992), this structure is an analogue for what might be expected to lie deep below the San Andreas Fault. To the naked eye this looks like a barren land, but take two structural geologists, a metamorphic petrologist and an expert in micromechanics and they’ll tell you otherwise. Examined through the right lens it’s a goldmine of opportunities. For my DPhil project it’s hard to imagine a more perfect field area. For the last two years I’ve been looking at a new way of measuring the historical stresses to which a rock has been subjected. 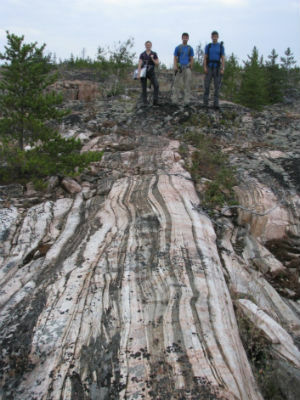 Having developed and tested my ‘piezometer’, it was time to try it in the real world and the Great Slave Lake shear zone was the perfect location due to its size and the great exposure of the rocks. In terms of work our aim was simple; to take a transect across the shear zone in order to reconstruct the paleo-stresses: the execution was harder. The vegetation was dense and the sun relentless. Each day we would conduct our ‘hit and run geology’, trailing from outcrop to outcrop snatching samples for latter analysis. Our neighbours were plentiful and unwelcoming. We encountered bears, a lynx, a bison and a beaver, all of which seemed disgruntled to find us on their land. Despite this we managed to solider on. 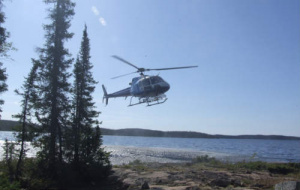 One highlight of the trip was when our collaborator at the Northwest Territories Geological Survey, Dr Edith Martel, joined us for a day in the field bringing a helicopter with her. This helicopter meant we got to travel tens of kilometres in a single day and collected key, otherwise unattainable, samples. It also meant we got to see some spectacular views from the sky. At least that was what I was told, considering the minute we were air bound I fell asleep! Considering my project is primarily experimental, I would have been unable to complete fieldwork without the aid of the Graduate Research Fund. 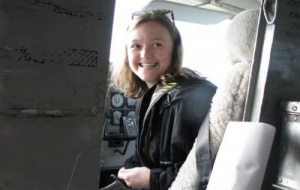 I’ve had the opportunity to make new collaborations with geoscientists at the Northwest Territories Geological Survey and have set the foundation for possible future postdoctoral work. In short, this trip has not only made my PhD project more multidisciplinary but has set the groundwork for my future career.